A simple black and white contrast may look a bit plain to some people. Here’s a fresh idea for you! Adding walnut in a dark setting may be an idea worth considering. You can keep the bold contrasting look and the walnut piece isn’t too light that it screams for your attention as soon as you enter the room. Another added bonus for adding a wooden walnut piece such as a dining table is the sturdiness it brings to the dining experience. You’ll want a table that not only looks good but can hold the weight of people resting their arms on the table. A great piece to consider is our Liam Solid Wood Dining Table. This table comes in various sizes to cater for your available dining area space. A strong sturdy walnut table to compliment your dark interior. You could even add a plant nearby to bring the natural freshness into your dining space to make it more lively. For some easily maintainable dining chairs consider the elegant Allegra Dining Chairs. Choosing the genuine leather option gives you a chair that will last longer and you don’t have to worry about stains so much. You know what happens when you spill something on fabric chairs. If you aren’t quick enough in wiping it away it will soak into the fabric. With leather, you could easily wipe it off with little effort. Finally, we need lighting to keep the area looking bright even after it gets dark. Dotting a few Clifford Pendant Lamps can help highlight areas in the dining room. Evenly spaced out and you’ll have a nice balance of light to go around your dining room to provide a wonderful dining experience. You can even find other great pieces to fill out your room to create the style that suits you. 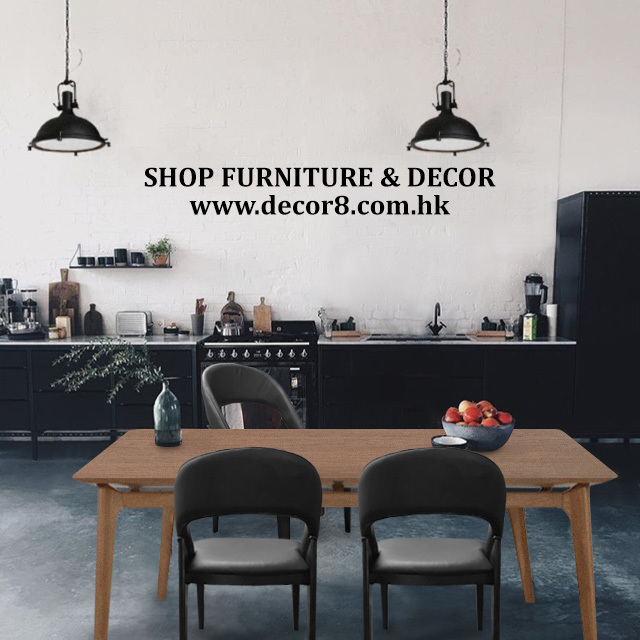 Find these items and more at our Decor8 website. This entry was posted in Ceiling Lights, Pendants, Chandeliers, Dining Chair, Dining Tables and tagged walnut.